I’m excited about my dinner out this week. 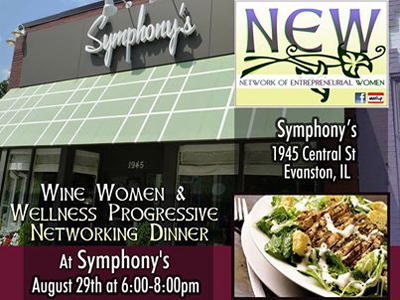 On Thursday the Positively NEW ladies will gather for a Progressive Networking Dinner at Evanston’s Symphony’s Cafe. We’ll have cozy tête-à-têtes while rotating tables between appetizers, entree, and dessert to maximize the networking fun. 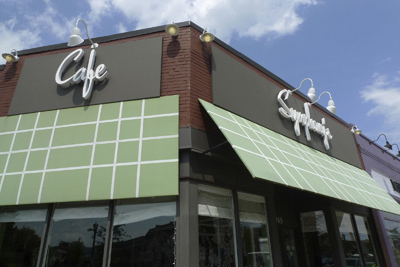 Symphony’s Cafe, located at 1945 Central Street in Evanston, offers vegetarian and non-vegetarian dishes and a wine list to add the ‘Wine’ to Wine, Women and Wellness. 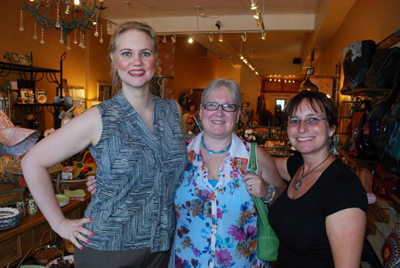 It’ll be another culinary adventure in my home town, along with the enriching company of fellow entrepreneurial women. I highly recommend making an afternoon of it and perusing the entrepreneurial shops along this street, many woman-owned. Coin metered parking (free after 6 p.m.) is available along the streets, and a freshly rehabbed credit card metered lot is located just west of the restaurant, next to Independence Park via Stewart Avenue. The Central Street Evanston Metra station is two (walkable) blocks East of Symphony’s. RSVP at our Meetup page or via Facebook, or pop in! NEW – The Network of Entrepreneurial Women is a group of Chicagoland business women who are upgrading business networking with fun and creative events that inspire attendees to work together, refer each other and most of all cheer each other on as the membership succeeds. Events rotate around various suburbs on a semimonthly basis, generally the 2nd Wednesday and 4th Thursday of the month.